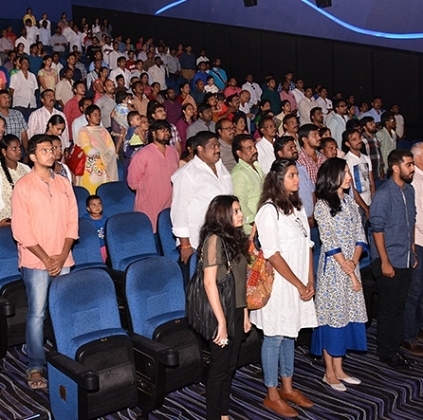 Eleven people were arrested by Kerala police for allegedly disrespecting Supreme Court's order when they did not stand up when National Anthem was played at the International Film Festival of Kerala (IFFK). The Supreme Court had ordered that the National Anthem should be played before the screening of movies and the eleven people, including journalists and film lovers who refused to stand up were booked and later granted bail. But their action has provoked many, including actor/producer Maniyanpilla Raju who feels that the police should not have given them bail. "Even foreigners get up and respect our National Anthem. Then why can't these people do that? They sit through a 2-hour long film without speaking a word, but are not okay with standing straight for 52 seconds? This is just a showoff. Will they do the same in Saudi Arabia? Such behavior should not be allowed and strong actions should be taken to stop this from happening again ", said Maniyanpilla Raju who has acted in more than 400 films. 14 years and still going stronger! A special day for Thala Ajith and his fans! Nayanthara to have a release this Friday! Keerthy Suresh’s next gets a ‘U’! A.R.Rahman to bag an Oscar again? People looking for online information on International Film Festival of Kerala, Maniyan Pilla Raju, National Anthem will find this news story useful.